The Permanent Court of Arbitration (PCA) issued a press release on October 15th, 2017, following the confidential conciliation meetings held last week in The Hague, Netherlands. 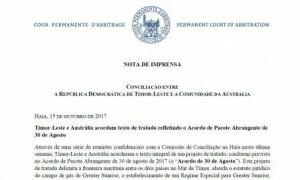 The statement said that "Timor-Leste and Australia have reached agreement on the complete text of a draft treaty" which covers issues such as the delimitation of the maritime boundary between the two countries in the Timor Sea, the legal status of the Greater Sunrise gas field, the Special Regime for Greater Sunrise, development of the resource and sharing of resulting revenue. This agreement reflects the Comprehensive Package Agreement of 30 August 2017 (the "30 August Agreement"), which was announced in a PCA press release on September 1st. According to the recent PCA statement, Timor-Leste and Australia “will now pursue their domestic approval processes in order to proceed with the signing of the Treaty". The press releasedetails the next steps of the negotiations. Over the course of the past week, the Timor-Leste and Australian delegations held a number of confidential meetings with the Conciliation Commission as part of a structured dialogue conducted in accordance with the United Nations Convention on the Law of the Sea (UNCLOS). The Commission and Parties also met with the Greater Sunrise Joint Venture. Having reached agreement on maritime boundaries, the Parties will now focus on engagement with the Greater Sunrise Joint Venture and thedevelopment of Greater Sunrise. The October 15thPCA press release ("Timor-Leste and Australia reach agreement on treaty text reflecting 30 August Comprehensive Package Agreement") is available here. The 1st of September PCA press release ("Timor-Leste and Australia Achieve Breakthrough in Maritime Boundary Conciliation Proceedings") is available here.